An Autel TPMS tool is designed to check the issues of TPMS that most modern cars come with. The tool lets you monitor tire pressure electronically making it easier to manage tires. There are tens of Autel TPMS tools out there. Picking the right one can be difficult. Worry not, we have done the homework. Let’s have a look at the seven best Autel TPMS tools on the market in this honest review before taking the right one for your vehicle’s TPMS sensors. This is a good fit for beginners and DIYers who want to activate and reprogram MX sensors. 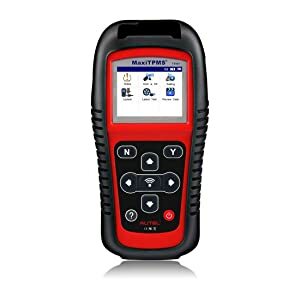 This is one of the best Autel TPMS relearn tools as it allows you to reprogram the system, activate sensors, and also check the temperature and tire pressure. TPMS Sensor Activation: With this tool, you can activate or test all the known vehicle sensors. It’s quite sturdy and also lets you check battery life and read sensor ID. By choosing the make, model, and year of the vehicle. Copy activation-clone’s IDs from the existing list to the new sensor. Manually inputting an ID on the original sensor. 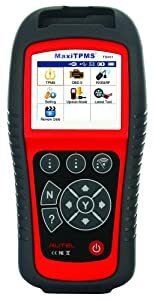 Friendly User Interface: This handheld Autel TPMS tool offers easy navigation to relearn, test, and reprogram TPMS sensors. It shows large icons with text labels to understand what a specific function does. Battery Indication: You can notice the battery life of each sensor individually to know when it’s time to change a particular sensor. Relearn Procedure For Specific Vehicles: When you enter the make and model of your car, this Autel TPMS programming tool will display a stepwise relearning procedure for your vehicle. Autel offers free software updates to users. Visit the official site, choose your vehicle and the product to download updates. Autel TS408 is compatible with TPMS enabled, domestic Asian and European vehicles. Moreover, it also supports large tires that measure 35 to 37 inches. Autel TS408 allows you to reprogram the system, activate sensors, check the temperature and tire pressure. Resets all tires under two minutes. It can clone Autel sensors. Activates all known TPMS sensors. Works flawlessly on BMW x3, Toyota, and Subaru. It cannot perform Torque sensor calibration. Doesn’t show the exact sensor voltage. A video of Autel TS408. Car enthusiasts, DIYers, and beginners can buy this Autel TPMS programming tool to find faults in the TPMS sensors. It’s also suitable for professionals as it offers reliable results. This handheld Autel TPMS relearn tool is an excellent choice for DIYers who want to read and program TPMS sensors. Sensor Reading: With Autel TS401, you can read OE part number, sensor ID, tire pressure, temperature, battery status, and collect information from the sensor as well. MX Sensor Programming: This Autel TPMS programming tool lets you program the MX sensor as well. You can replace OE sensors and view relearn procedures on the screen. Responses: This TPMS relearn tool offers information in both audio and video forms. It is a valuable feature for users who are not fond of reading or who find it difficult to read. Reads And Clears TPMS Light: It lets you read and clear TPMS light by identifying the issue in no time. Battery: Autel TS408 is a rechargeable unit and comes with a built-in 3.7 lithium polymer battery. It offers a good run-time and also helps save juice thanks to the auto-shutoff feature. Easy To Use Interface: It offers step-by-step and detailed information. Whether you’re a new user or someone with experience with similar devices, you will find the interface to be a breeze. It is easy to navigate. The LCD screen is elegant (128×64 pixels ) and also offers contrast adjustment. Autel offers free updates. Users are encouraged to download timely updates to make sure the device runs well. This Autel TPMS tool is compatible with all domestic, Asian, and European models that are TPMS enabled. However, it might not run on some Japanese car models. Autel TS401 is an excellent choice for DIYers who want to read and program TPMS sensors. Reads and resets TPMS lights. Works with continental type sensors. Reassigns locations with relearn mode. May not work well if not updated. A video of Autel TS401. This Autel TPMS reset tool is ideal for auto shops, mechanics, and DIYers who want to perform TPMS relearning and sensor programming. This Autel TPMS tool offers every TPMS function there is to operate on a vehicle. You can read tire pressure and sensor IDs with this tool. It’s also able to reprogram and clone sensors. Clone Sensors: This is a useful feature that lets you clone sensors. It is similar to performing an ECU relearn. 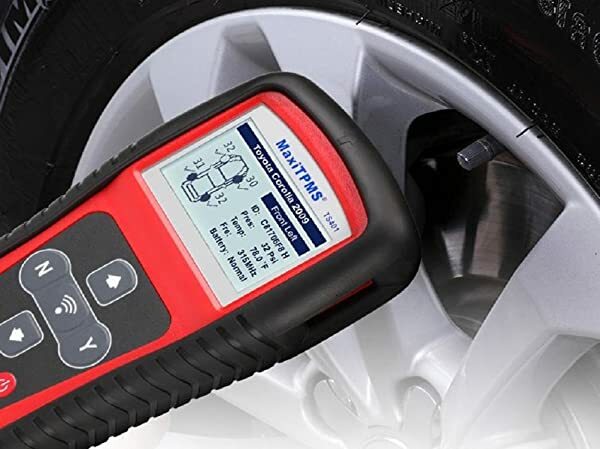 TPMS Scanning: It will tell you about the faults in the sensors and also recommend if you need to replace the sensors or not. Quick Diagnosis: This is a wireless tool that offers a rapid TPMS diagnosis. You can activate all the known TPMS sensors from this device under 2 minutes only. Information At Fingertips: The screen displays direct feedback from all the four sensors. Apart from that, it will also show you the status of all the TPMS features so that you can find faults easily. Easy To Use: It has a user-friendly screen. All the information is shown on one page, removing the need to navigate. Updates are free for this tool. You can visit the website and download the latest version to enjoy error-free communication. Works with all domestic and foreign TPMS enabled vehicles. 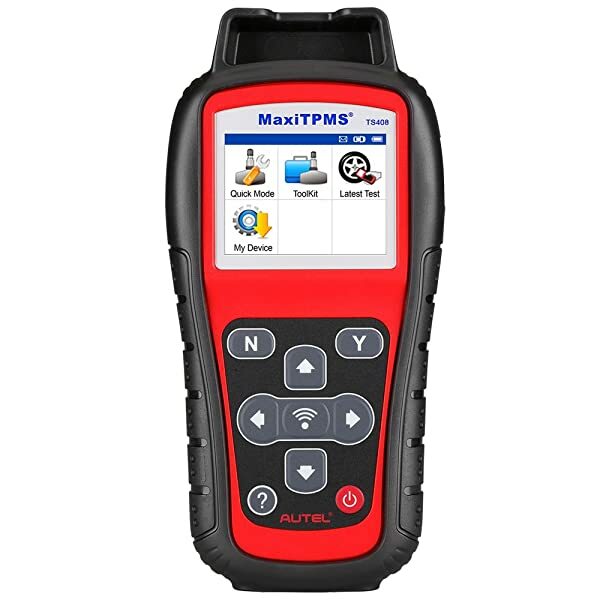 Autel MaxiTPMS TS501 offers every TPMS function there is to operate on a vehicle. The instructions are simple and easy to comprehend. Offers stepwise OE relearn procedures. Offers RF tester for the key fob. It cannot program aftermarket sensors. A video of Autel MaxiTPMS TS501. Users who want to program sensors, check the temperature and find TPMS related faults can consider this Autel TPMS tool. 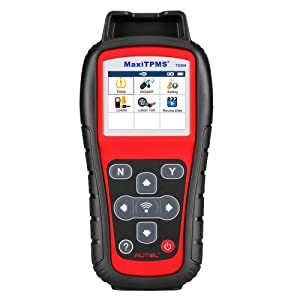 If you’re looking for an Autel TPMS tool that can activate and read sensors, pinpoint system faults and program MX sensors then consider investing in Autel MaxiTPMS TS508. Program MX sensors: It can program MX sensors to replace previous OE sensors. The scanner supports all four methods. Relearn Sensor ID: It shows detailed instructions on how to relearning sensors. You will face no difficulty in getting the job done. Apart from that, you can also perform OBDII relearns by connecting this Autel TPMS relearn tool to the OBDII port. Shows System Faults: It shows system faults in the tires and sensors. This information is valuable and can help keep your vehicle in good condition. The scanner offers free updates, which is an essential feature since updates are necessary to keep away bugs. It supports all Asian, domestic, and European models that have TPMS functionality. Autel MaxiTPMS TS508 can activate and read sensors, pinpoint system faults. Shows sensor ID, battery level, temperature, and tire pressure. Shows vehicle specific relearn procedures. Can be a little heavy at 4 pounds. A video of Autel MaxiTPMS TS508. Professionals and mechanics who want to perform advanced TPMS functions and replace sensors should get this tool. This Autel TPMS programming tool is more expensive than other options but is worth the price. It offers two diagnosis modes: Quick and Advanced. Quick Mode: Allow you to activate all TPMS sensors and reprogram brand new sensors. Advanced Mode: This mode involves sensor cloning. It will eliminate the need to relearn ECU. In addition to that, you can also perform TPMS scanning in the advanced mode. It will dictate faults in the TPMS system if any. 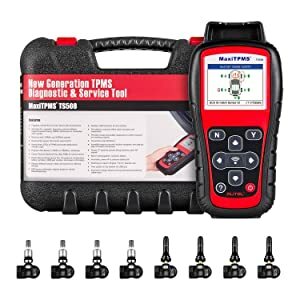 8 TPMS Sensors: When you purchase this Autel TPMS relearn tool, you will get eight programmable TPMS sensors with it, which will save you money when your current sensors malfunction. You can only have them replaced with these sensors. TPMS Status Screen: This tool can read ECU sensor ID, check sensor ID, read and erase DTCs from ECU, and view DTC description as well. 4-Programming Options: You can copy by activation, manual input, auto create 1-16 or copy from OBD. Autel throws new updates from time to time that can be download from the official website for free. Keeping the tool up to date is necessary to enjoy all the functions it offers. It supports all TPMS enabled domestic and foreign vehicles. However, the sensors it comes with may not be compatible with all cars. 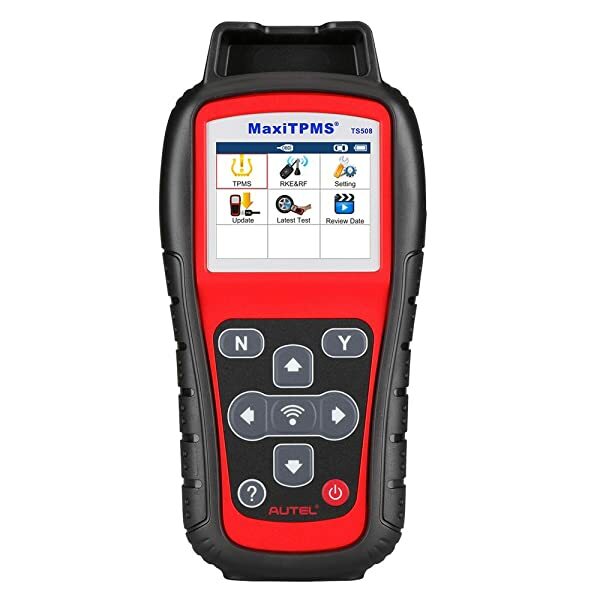 Autel MaxiTPMS TS508K allows you to activate all TPMS sensors and reprogram brand new sensors. Comes with four 315MHz MX-Sensors and four 433MHz MX-Sensors. Advanced mode lets you perform advanced TPMS diagnostics. It can monitor up to 8000 kPa psi. Lets you write, relearn and activate Autel MX sensors. Only works with Autel MX sensors. A bit heavy at about 4.5 pounds. People who want to perform TPMS functionality, read/write sensors, and perform a few basic obd2 code reader functionalities can use this scan tool. This Autel TPMS programming tool offers more than just programming the vehicle sensors. It can read and reset TPMS codes along with a few other obd2 codes. Data And Graph: This is among the few Autel TPMS tools that present data in the form of graphs. You will find it easier to grasp information. Plus, the device even offers some additional tests such as the smog test. 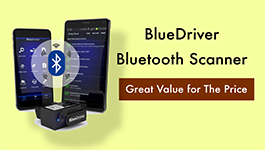 It can be valuable if your OBD scan tool does not offer such features. Advanced TPMS Functionality: With this Autel TPMS reset tool, you can relearn ECU, read and activate sensors, and read and clear TPMS-related codes. Turn Off TPMS Light: Besides reading TPMS codes, it can also help you reset the TPMS light once you fix the problem. Reprogram ECU and Clone Sensor ID: You can wirelessly reprogram your vehicle’s ECU, auto create or clone sensor IDs, and manually write sensor IDs as well. Battery Status: It can give the battery status of all the sensors and if they need replacement. Software updates are free to download. Visit the website and register the product to update the tool. Works with all TPMS enabled foreign and domestic vehicles. Autel TS601 can read and reset TPMS codes along with a few other obd2 codes. Prints TPMS data via PC. Works as a primary OBD2 reader (live data, graphs, DTCs). Can be a bit difficult to understand and operate for beginners. Only works with Autel Scanners. A video of Autel TS601. 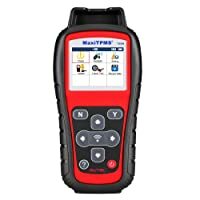 Professionals, mechanics and auto shops should consider this tool as it helps carry out a full system diagnoses and can easily find TPMS related issues as well. 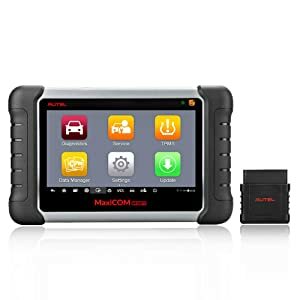 This powerful 7-inch touch screen TPMS tablet is for professionals who want to perform a system diagnosis to find faults. Apart from TPMS features, it also lets you read and perform oil light reset, calibrate SAS, read and erase codes, and perform key programming. EPB: This Autel TPMS reset tool lets you check problems in the electronic parking brake system. You can also use it to reset the system. DPF: It will check for soot and other problems that occur in the diesel particulate filter. SAS: With this tool, you can calibrate the steering angle sensor. BMS: This tool will help you reset the battery. With this, changing the battery will be a breeze. IMMO: It can perform key programming on the car to restrict access. Moreover, it can perform injector coding as well. Activate 98% of all known TPMS sensors. Program sensors using any one of the four methods. You can download free updates for one year by visiting the official website. It supports all TPMS enabled 1996 OBDII vehicles including Saab, Tesla, Volvo, Saturn, Smart, Skoda, Rolls-Royce, GMC, Ford, Dodge, Chrysler, Chevrolet, Pontiac, Mercury, Lincoln, Jeep, Hummer, Cadillac, Buick, VW, etc. 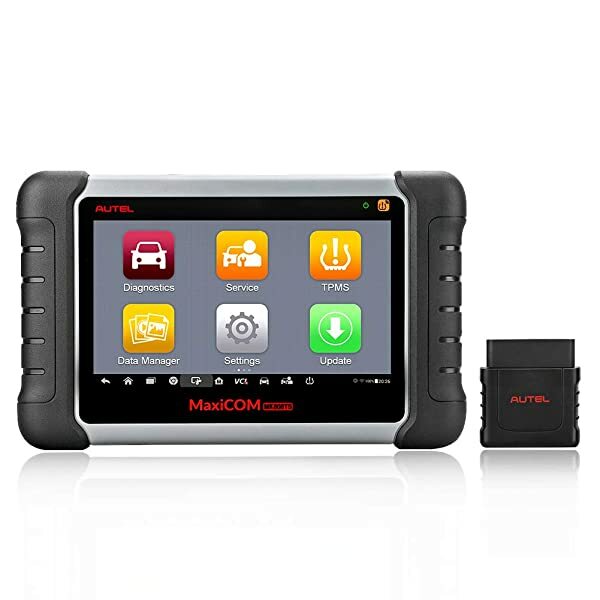 Autel MaxiCOM MK808TS is for professionals who want to perform a system diagnosis to find faults. Offers full system diagnoses and advanced TPMS features. Shows live stream in a graphical mode. The big screen is bright and easy to read. Can be a bit uncomfortable to handle due to its weight. A video of Autel MaxiCOM MK808TS. If you want a basic scanner, then consider Autel TS408. It lets you perform TPMS sensor activation, program sensors in three ways and shows battery status as well. Autel TS401 MaxiTPMS can be a good choice for more advanced features. It can program and read sensors easily. Its highlight is the ability to get messages in audio and video formats. 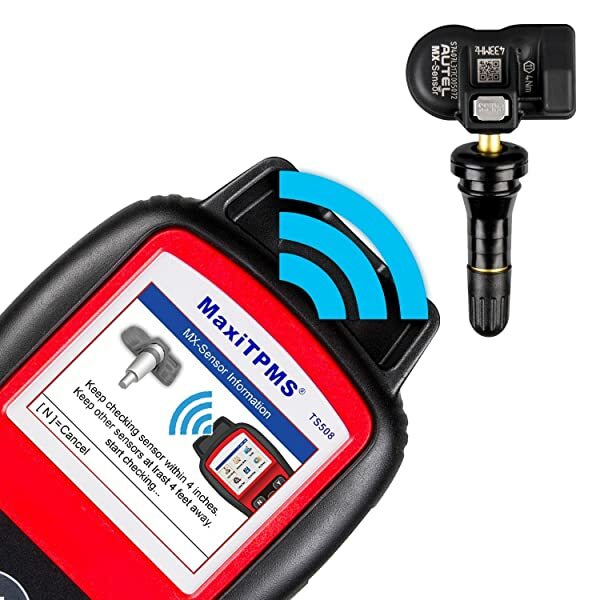 Last but not least, Autel MaxiTPMS TS501 offers advanced TPMS features such as sensor cloning, quick TPMS scanning, and sensor programming. It is for professionals who want to perform advanced TPMS features. In the end, choose the Autel TPMS tool that fits your requirements and is compatible with your vehicle.